Frangipani is a timeless, colourful, fragrant flowering tree also known as plumeria and the Hawaiian Lei flower. Native to warm tropical areas such as Mexico, the Pacific Islands and the Caribbean. Lei garlands have become a tourist tradition when visiting tropical islands such as Bali and Tahiti, boasting their irresistible, complex, lush, rich floral fragrance. The flowers are waxy, long-lasting with a caution in being exposed to their poisonous white sap. Frangipani oil has been used in perfumery since the 16th century, usually as a sensual top or heart note, applied as a naturally enticing aphrodisiac and is said to have anti-oxidant and anti-inflammatory properties. It can also promote confidence and inner peace. The idea of a romantic island style holiday comes to play when thinking of the frangipani flower. Frangipani flowers are considered sacred and are widely used in religious ceremonies with common names given to the tree such as the Temple Tree in India and the Far East and the Graveyard Tree in the Caribbean Islands. Furniture, instruments and tableware are manufactured using the Frangipani’s white, light and soft wood. 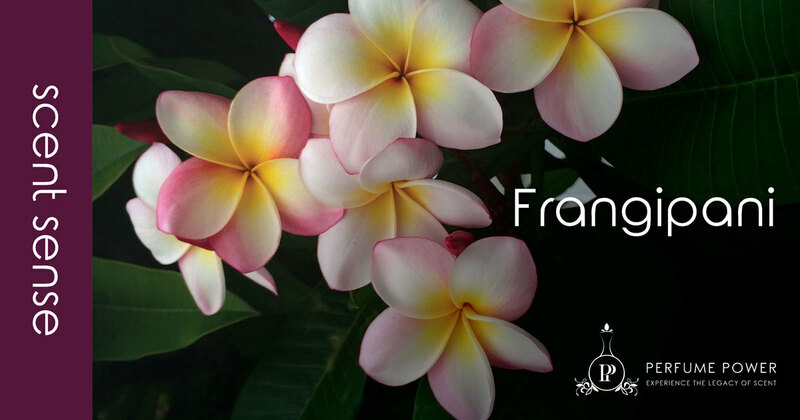 Interestingly the name, frangipani, comes from the Italian nobleman, Marquis Frangipani, who created a perfume used to scent gloves in the 16th century. When the Frangipani flower was discovered, its natural radiant and captivating perfume reminded people of the scented gloves, and so the flower was called Frangipani. Another version has it that the name, frangipani, is from the French frangipanier, which is a type of coagulated milk that Plumeria milk resembles.